This Japan tour can be described in one word: Excellent. An incredible experience. Everything was very well done. 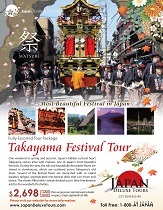 I enjoyed this Japan tour seeing all the different sights, especially going to Takayama. Thank you Japan Deluxe Tours for the excellent time.